When working with large data sets, if you scroll down or to the right of the worksheet you would lose track of the row/column headings. 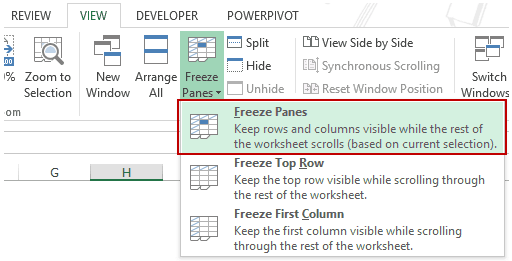 In such situations, you can use the Excel Freeze Panes feature to freeze rows/columns/ so that the headers always visible no matter where you scroll in your data. 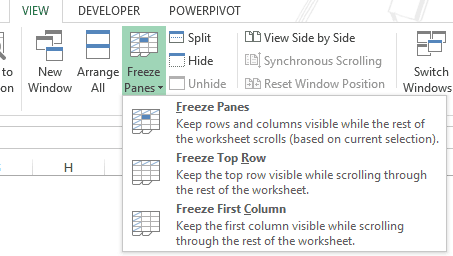 Freeze Panes: It freezes the rows as well as the columns. Freeze Top Row: It freezes all the rows above the active cell. 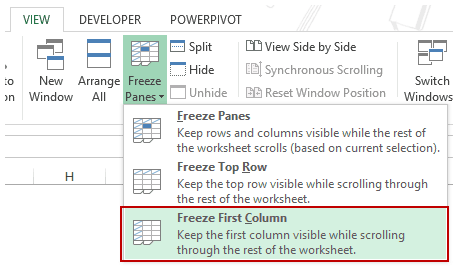 Freeze First Column: It freezes all the columns to the left of the active cell. If you are working with a dataset that has headers at the top row and a dataset that spans hundreds of rows, as soon as you scroll down, the headers/labels would disappear. In such cases, it’s a good idea to freeze the top row so that the headers are always visible to the user. How to Freeze the top row. How to Freeze more than one row. Go to View –> Zoom –> Freeze Panes. In the Freeze Panes drop-down, select Freeze Top Row. This will freeze the top row of the data set. You would notice that a gray line now appears right below the first row. If you have more than one header rows, you may want to freeze all of it. Select the left-most cell in the row which is just below the headers row. In the Freeze Panes drop-down, select Freeze Panes. This will freeze all the rows above the selected cell. You would notice that a gray line now appears right below the rows that have been freezed. In the Freeze Panes drop-down, select the option to Unfreeze Panes. If you are working with a dataset that has headers/labels in a column and the data is spread across many columns, as soon as you scroll to the right, the header would disappear. In such cases, it’s a good idea to freeze the left-most column so that the headers are always visible to the user. How to Freeze the Left-most Column. How to Freeze more than one Column. 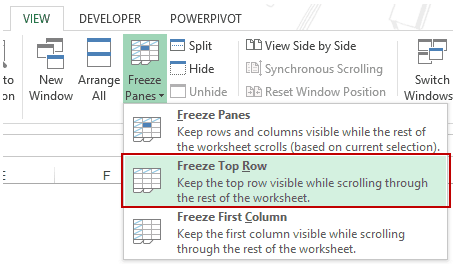 In the Freeze Panes drop-down, select Freeze First Column. This will freeze the left most column of the data set. You would notice that a gray line now appears at the right border of the left-most column. 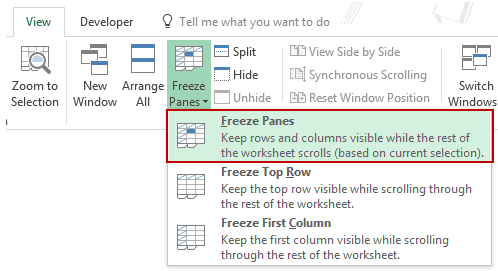 Once you freeze a column, you can not use Control + Z to unfreeze it. You need to use the unfreeze option in the Freeze Panes drop-down. If you insert a column to the left of the column that has been frozen, even the inserted column is frozen. If you have more than one column that contains headers/labels, you may want to freeze all of it. Select the top-most cell in the column which is right next to the columns that contain headers. This will freeze all the columns to the left of the selected cell. You would notice that a gray line appears to the right of the columns that have been freezed. In most of the cases, you would have the headers/labels in rows as well as in columns. 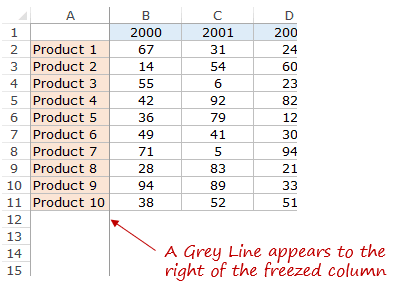 In such cases, it makes sense to freeze both rows and columns. Select a cell just below the rows and right next to the column that you want to freeze. For example, if you want to freeze two rows (1 & 2) and two columns (A & B), select cell C3. Select the Freeze Panes option from the drop down. This will freeze the column(s) to the left of the selected cell and row(s) above the selected cell. You would notice two gray lines appear – one right next to the freezed columns and the other right below the freezed rows. Apart from working with large data sets, one practical use of Exel Freeze Panes is while you are creating dashboards. You can freeze the rows and columns that contain the dashboard so that the user can’t scroll away and the dashboard is always visible. A good practice while working with large data sets is to convert it into Excel Tables. By default, all the row headers in Excel Tables are always visible when you scroll within the dataset. “How to Freeze More than One Row” is not correct. Of course, you have to click “Freeze Panes” instead of “Freeze Top Row” for more than one row. Sir please tell me full details of page layout tab.